This kit includes a fuser, manual feed tray pickup roller, manual feed tray separation pad, and cassette tray pickup roller. 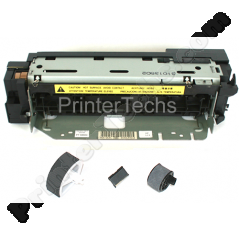 For use in the HP LaserJet 4 or 4M. Alternate part number RG5-0454. Before purchasing, please double check that your printer is a LaserJet 4 or 4M, and not a LaserJet 4Plus or 4MPlus! You can save some money by purchasing the kit with fuser exchange. See exchange details further below. Please note that the part numbers given in parentheses change on occasion. Most parts have several different part numbers but they all describe the same part. Transfer rollers -- For best print quality, we recommend you continue using your old transfer roller. Good transfer rollers are simply not being made anymore. The genuine HP transfer roller has been discontinued, and literally every aftermarket transfer roller we tested from various Chinese manufacturers caused print defects. If your old transfer roller ever gets dirty to the point of leaving print defects (rare), you can clean it by blowing the transfer roller off with canned air, and/or gently rubbing away the excess toner using a dry lint-free cloth. Before purchasing, please double check that your printer is a LaserJet 4 and not a LaserJet 4 Plus! See the logos below. The LaserJet 4 Plus takes a different maintenance kit.